Bingley turned 10 months old on the 9th and I thought it would be interesting to post what his coat looks like. He's my first sheepie so it's all new and exciting to me!!! This picture is a little fuzzy but I'm amazed by all the different shades of gray there are all over his body. All these pics are from his left side. His right side is changing as well but not quite as noticeably to my eyes. 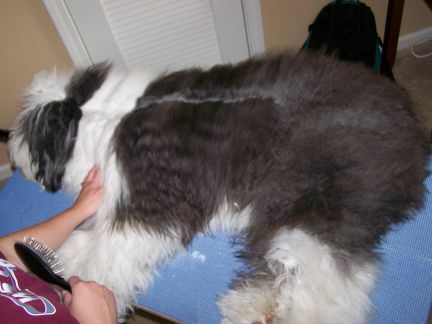 A question for those who have kept their pups in coat as they changed: I have noticed that his hair is blackest farthest away from his body and grayest closest to the skin (as expected) BUT I've also seen almost an inch-wide line of gray in between, outlined in black. Is this the norm? I never expected that! I tried to get it with the camera but I don't think you can see it from these pics. Yes, what you are seeing with the color change is pretty typical. It doesn't look like it's changing that much yet so you're in for some mat fun! Frank's coat at age 3 is still lighter to the skin and he has dark tips. It's kind of cool looking. Looks like he is just beginning, what fun! Panda's changed so quickly I was able to see an inch of new grey coat a month in wel defined lines, but hers didn't change til she was well over a year old. Tucker is only 6 months but I am seeing some grey wisps throughout his coat and especially on his hocks. I think he will stay fairly dark though. All my other oes have grey skin under the dark coat, his skin is black. It's so weird that in the first picture he looks just like Toby!!! Toby took the longest time to change. He still has black tips and he's 2 and a half. It looks like you're doing a good job with his grooming. (That's a nice brush, by the way!) But what's up with that guy in the background just sitting on the computer? Shouldn't he be doing some grooming related chores too? But what's up with that guy in the background just sitting on the computer? Shouldn't he be doing some grooming related chores too? Hey! I do my part. "Ian, come make him stay put!" "Would you come look at this, Ian?" I figured you'd say that you were posting to the forum for her while she dictated and brushed! Dad, I need a belly rub, while Mom is brushing. Dad, I need a belly rub while I'm brushing. My first show sheepie girl took forever to lighten up, I think by memory she was nearly 3 by the time the junior coat was completely through and 5 by the time the full mature coat happened. Thought she was never going to change, but she eventually did. I just Bingley. What a pretty dog. You're doing a great job! That looks amazingly like Chewie at 10 months. He is still all black on the outside, but if you part him he has varying levels of gray. 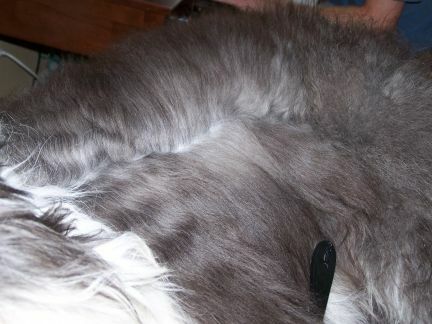 On his back to mid ribcage it is a solid gunmetal looking gray, from midribs to close to tummy it is much lighter and has many interspersed white/silvery hairs. Part of me wishes the change to go faster - less mats and I want to see what color he will be. The other part of me wants to hold onto the baby hair, knowing when it goes, it will be gone forever. That's how I am feeling, too! You explained it perfectly! MY oes is 8 months and his coat looks a lot like bingley. Still mostly black but he does have the grey shades all over his body. I think he might change slow. 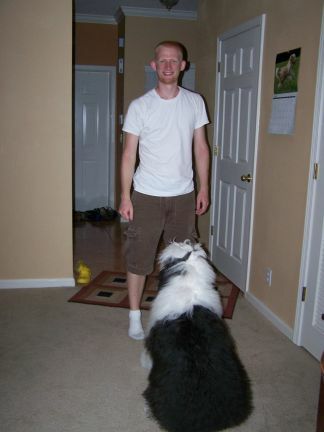 Hi is there a time frame when a sheepie will matt real bad? And if so after its over will it be better? There is no time frame for a sheepie changing coat, there is actually 2 major coat changes till the mature coat is finally through, some go through the changes quite young some later & some seem to take forever and yes once it all is through it gets easier with the matts. 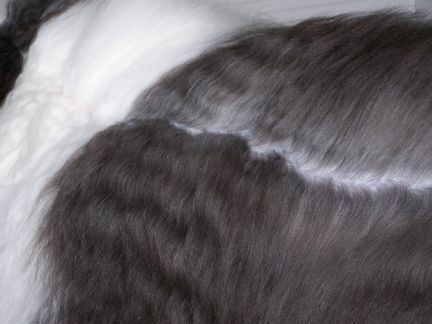 Coat changes are a harder stage to keep them with coat as they do clump up quicker, so when they are changing you probably need to brush a little bit more often then what you regularly do in your grooming routine. Here is a link have a read. OH! I love Bingley, he's a bit of a celebrity to us as we see more footage of him on the net than any other sheepie. He's looking really big now, those pics of his coat are so interesting as we don't have a sheepie ourselves yet. It's amazing, all those shades of grey & the texture looks lovely. I think the learning stages of grooming and show grooming is really fun!! It's great to know you are enjoying it too (the learning experience)... You are doing such an awesome job, Emily! George is 8 months and he is already very very grey. He started to change at about 5 months and has no black left at all! Bella changed to grey about 5 months. She's now 8 months and getting to be even lighter. 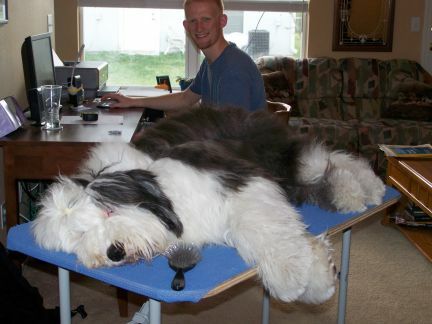 The associated question I have is what do people do to get their dogs so calm while brushing. It is not a war but it is a battle even with lots of praise and loves.